The DC comics’ The Source blog just released the combined image ot the White Lantern variant covers from Brightest Day, by Ryan Sook. Sook recently had stellarly worked on “Kamandi” in “Wednesday Comic”, and these covers he just made are no exception. 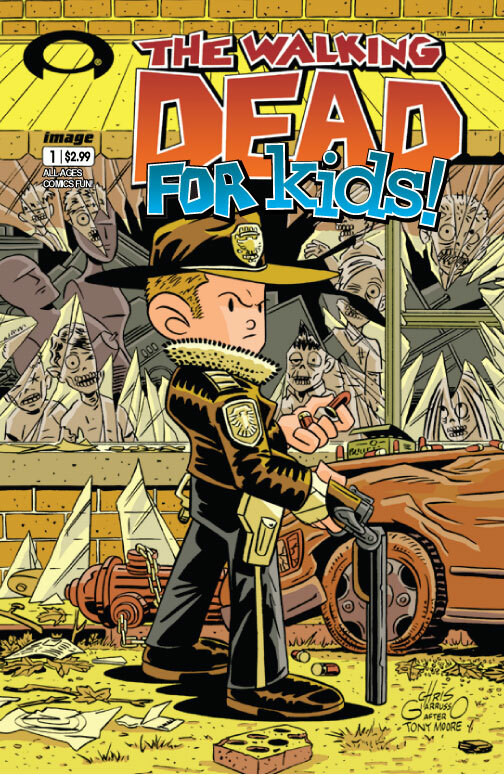 The image features the characters ressurected by the White Entity at the end of Blackest Night and was given special tasks (The Labors of the Twelve) before they can truly live again. 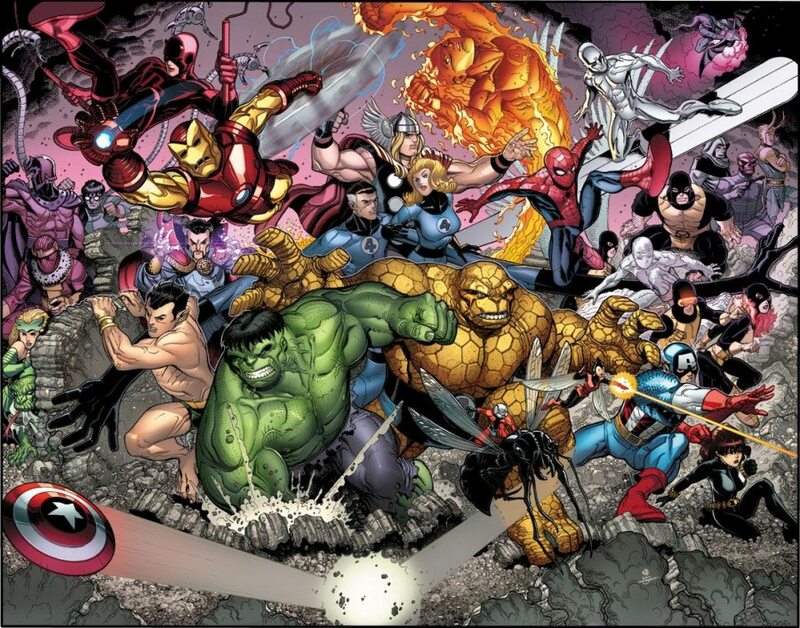 These characters are featured in an orientation similar to Michaelangelo’s work on the Sistine Chapel/, that also includes the origin of the lantern spectrum Entities mirroring the origin of life as described in the Bible. If you have’nt been following Johns’ Green Lantern book during Blackest Night, then we’ll give you a brief history lesson regarding life in the DC Universe and its connection to the Entities of the emotional spectrum. 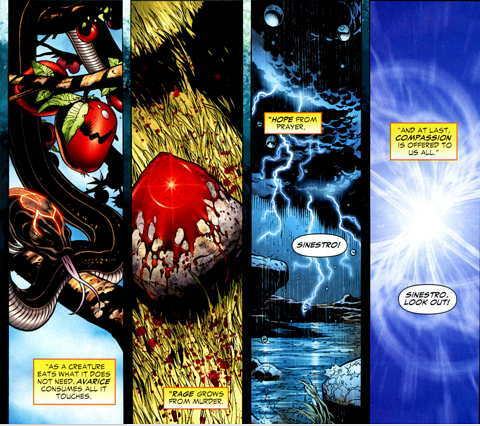 It is in Green Lantern #42, when Sinestro became the White Lantern and sees the origin of the Emotional Spectrum stretching back to the beginning of life itself. When the white light entered the universe it was during the primordial period of Earth that “the first sentient creature in the universe to ever will itself to move… do[es] just that. And it is the origin of willpower itself.” . 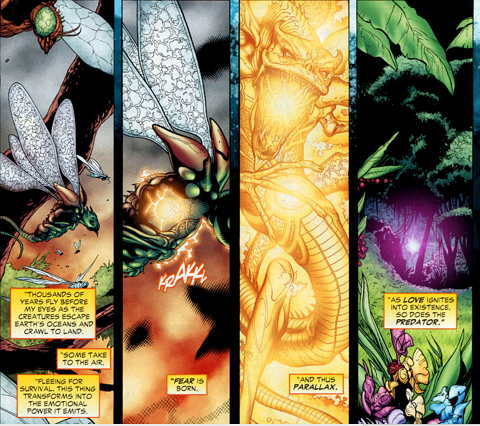 The Green Lantern Corps’ green entity Ion was the first that emerged and Parallax followed after (see below). And Love emerged presumably in the Garden of Eden, the violet light of the Star Sapphires and the Predator was born. Avarice shows up next, as a snake who well be Ophidian, coiled in an apple tree – another Garden of Eden reference. Rage is given birth after the first murder – Cain killing Abel, Hope brought forth by prayer during a great flood – could Noah’s ark tale or other great deluge myths, and lastly, the Indigo light of compassion. Variant Covers of Ultimate Comics Thor! DC’s DOOMSDAY CLOCK #1 heads back for second printing! Bechko & Hardman shine GREEN LANTERN: EARTH ONE VOL. 1 in 2018! BREAKING: Warner Bros. Unveils DC Comics’ Film Schedule! X-MEN and INHUMANS head in to Prime this March 2017!